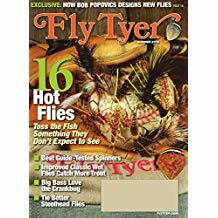 Fly Tyer is the only magazine dedicated to the art and craft of fly tying. Articles, columns, and departments provide practical tips and techniques from the experts illustrated by detailed step-by-step recipes and photos. The best magazine for everything from hatch-making trout flies to the latest saltwater patterns, along with techniques and tricks that will make anyone a better tier-whether they've been tying for two months or two years.